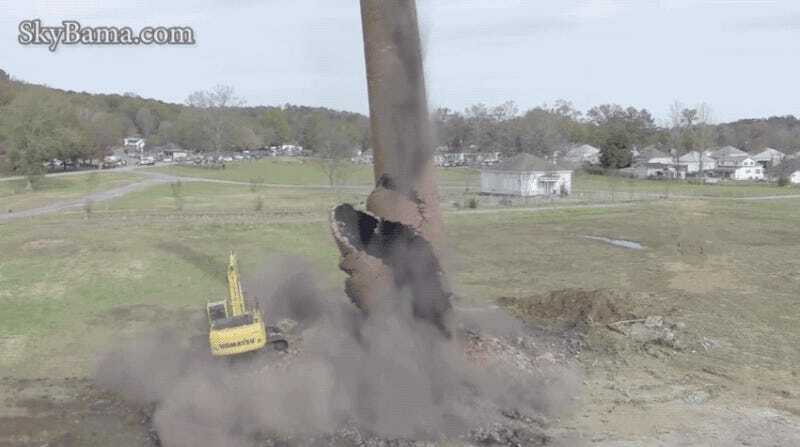 After two unsuccessful attempts to topple a 115-year-old chimney stack with explosives, construction worker Tim Phifer from Pell City, Alabama, decided to bring it down with an excavator. Bad idea. The 2.6 million pound, 158-foot tall smokestack did not come down as planned, falling right on top of the excavator. Incredibly, Phifer walked away with only a covering of soot and a few scratches. Members of his team instantly rushed in to help, including Phifer’s daughter, Allie Phifer, who was desperately trying to reach him. But moments later, one of his team members threw his arm victoriously into the air, giving everyone a thumbs up as Phifer emerged from the rubble. “I’ve had some stuff go wrong but not like this,” Phifer said. Phifer claims his decision to stay in the cab, which is designed “to turn over on top of it,” probably saved his life.